Shillong, the capital town of Meghalaya state in India is very famous for handicrafts. If you wish to carry home some of the handicrafts available in India, then Shillong should be one of your destinations. There are various markets in Shillong which houses souvenirs that you can take along as a tourist before heading back home. After all you need some unique things to present to your family and friends! And what can be better than indigenously made handicrafts! Well, the best markets for these handicrafts are Bara bazaar (also known as Lewduh Market), Police bazaar and Laitumkhrah which are also the main shopping centres in Shillong. Bara bazaar is an open street market, the largest in North-East India. 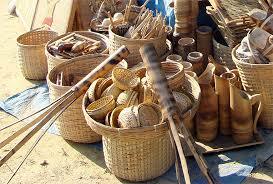 Handicrafts and hand loom is also available in Meghalaya Handicrafts, Purbashree and Khadi Gramodyog. Timings: 8am to 5pm (till sunset, mostly). You will love to buy and keep some forest honey and yummy bamboo pickle prepared by the local people. A shopper's paradise indeed! Various types of dried fish, betelnut, exotic fruits and vegetable are available here. Don't miss out on pineapple pieces sprinkled with spices available at every nook and corner of Shillong. The cottage industry contributes considerably in the economic development of Shillong - Known as 'Scotland of the East'. Tibetan artifacts, Khasi dresses, handicrafts made with bamboo and cane, textile weaving, ornament making, wood carving, carpet weaving etc. hold an important place in Meghalaya’s art and crafts. The diverse tribes in Shillong are fond of weaving. They make cane mats, stools, baskets (open weave carrying baskets and closed weave carrying baskets), wood carvings, bamboo fishing traps, storage baskets, trays, fans, cane containers, trays, caps, umbrellas and winnowing fans. Weaving is the favourite occupation of Khasi people - whether it is weaving on cloth or on cane, they are adept in it! Wood carvings are very beautiful just as is bamboo work. 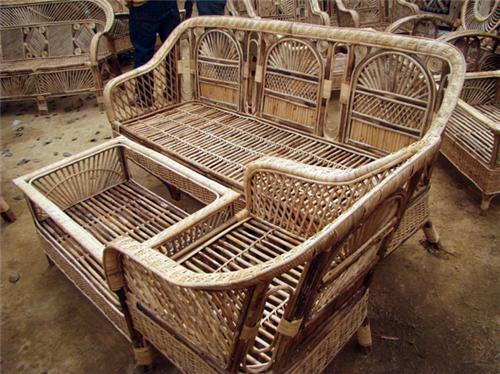 Both wood and bamboo are available in abundance in Meghalaya. The Khasi tribe in Shillong loves weaving mats, baskets, moorahs, Khasi umbrellas (locally known as kurup), sieves, cane chairs etc. They make domestic knives, guns and utensils with the iron ore available here. Tlieng is a popular mat known for its durability. Baskets in Shillong are known as Baskets known as khok or thugis. Meghum Khoks are utilize for storing various items at home and for storing clothes. Silk weaving, carpet weaving, making ornaments and musical instruments too is common in Shillong. The Jaintia tribe specializes in making fishing traps out of bamboo. The Garo tribe is adept at weaving dress materials which are used for stitching dresses, shirts, bed sheets, bed covers and table covers. They weave Dakmanda, a material used for their dress. They are good at making bamboo items too. The cottage industry of Shillong has earned a good name all around the globe. These handicraft products produced locally are exported to international markets. The range of handicrafts is immense , the quality at par with the best! Can you help us with the names of some manufacturers. We could need larger quantities.Regards. where is it possible to buy this stuff online ?